Back in October of last year I was so taken with Micro Four Thirds, and in particular with Panasonic cameras and lenses that I wrote a short piece on my blog about the possibilities of using the system for my "professional" (I really hate that word!!) work. It was mentioned at the time that I must be crazy to try this & the question "Why??" was asked many times. My answer was that I was fed up working with big heavy cameras. I wanted to see if I could work with equipment that I enjoyed using. Does the title - enough is enough - give a clue as to the possible failure of the idea of m4/3 as a "pro" system? The answer to that is yes and no. Is there a definition of a "pro" system? Well not really. People earn their living as photographers from many different sources. There are photojournalists and fine art photographers who use whatever camera they think fits the situation. Here are some examples of photographers who use what might be called "non-professional" cameras for paid work. Those who earn a living shooting stock photography are also able to choose whatever camera they feel comfortable with. However my original piece was about the possibility of m4/3 being used in conventional professional situations, such as weddings, events, commercial and industrial photography. So have I used m4/3 in these situations? The answer is yes. Have I used m4/3 exclusively in these situations? The answer is no. When I suggested the original idea, one of my concerns was is the kit up to job? 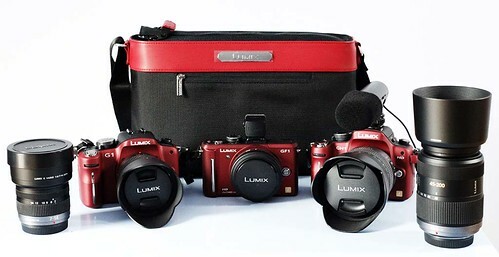 I was somewhat worried about the ability of the Panasonic G series cameras and lenses to stand up to a heavy work load. The answer to that, and one that surprised me somewhat, is that yes it can. Together with my colleagues in my company, we have subjected a pair of GH1's to some pretty tough use, including the interior of a factory with dirt, dust, high temperatures and sparks flying everywhere. They have worked flawlessly, and have coped with being left on for 1/2 hour at a time shooting video. One of the bodies has a few scuffs, but other than that no problems. We have however been fortunate in that we haven't had to work in the rain. Book us for your wedding photography and the sun comes out!!! We do realise that we won't always be so lucky however, and since the GH1's aren't weather sealed we would have problems with that. Primarily these cameras are used for video, and that has been the real success story of this "experiment". We intend to continue using these as they suit the work we do very well. We await the GH2 impatiently! So thats a plus. For stills the situation is not quite so clear cut. While I (we) have used m4/3 cameras to shoot stills "professionally" there are some problems. 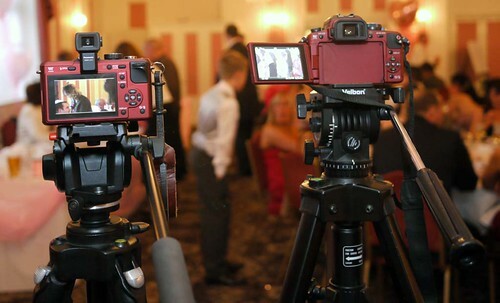 500 images alone were shot using the GH1's at last weeks wedding (as a 3rd. camera) but the majority of the ones that will escape the "trash" are shot outdoors in good light. The problems of m4/3's ability to shoot in low light are well known. I have shot many images at weddings, events etc using m4/3 plus a flashgun. But there are many situations which require the use of natural light, and that is where the system struggles. The other problem is the speed of operation. AF, continuous shooting are all slower with m4/3 as compared to the Canon DSLR's that I use. Attempting to photograph a large group of people and making sure that they all face the camera, have their eyes open etc. is not easy. However an 8fps motordrive gives a far better chance of "getting the shot"
"I have no intention of abandoning my interest in m4/3 or Leicas and will continue to use these for my stock photography work. However the experiment of seeing If I could do all my photographic work with the tools I preferred rather than those that are right for the job, is largely over." This comment was about shooting stills and I have every intention of continuing to use the GH1 for video work in "professional" situations. So the original intention has proved possible for part of the work I do. The DSLR's will probably however continue to sit unused as stills cameras between these "Pro" jobs. For my stock photography work, I will be using the cameras I enjoy carrying around and taking pictures with, and for the moment it seems likely to remain that way. Many will say "I told you so" and will think that I was both stupid and wasting my time to even consider doing this. I always suspected that I would never risk working exclusively with m4/3 and though it seemed a nice idea, with the current state of the system its just not possible. So something like a Canon 7D was always on the cards. It is a nice camera and I have "positive" feelings towards it. I'm going to try to use it a bit for shooting stock, but I doubt whether it will get used much for that, because of the weight.